Alum Shadow And His BFF! In September of 2009, our family adopted two beautiful puppies, Shadow(formerly Ruger) who was then about 6 months old, and Ruby (Tamy) who was about 5 months. They were intended as pals for our twin 6 year olds. They are a mischievous pair (kids and dogs! )Ruby and Shadow have learned to open there run door to get out when we’re away, open the house doors and let themselves in so they can plunk down in their favorite spots in the bedrooms and wait for us. Now we just leave the doors open for them! They have brought fun, love and joy into our home. 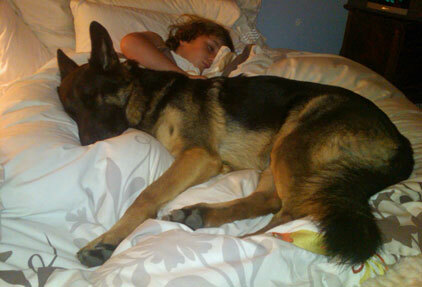 The attached pix is of Shadow asleep with his best buddy!